This sold-out opening night, for one of opera’s most popular works, utilized the dependable and acclaimed 1990 staging by film director Liliana Cavani (The Night Porter), that La Scala has since produced many dozens of times. 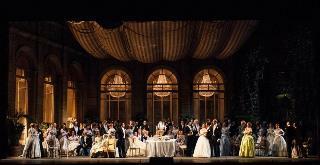 It’s also one of the best-ever productions of La Traviata. It is a production faithful to the period, with sets designed by Dante Ferretti and elegant costumes created by Gabriella Pescucci. It’s quite lavish considering La Scala’s means, and brilliantly staged by Cavani, one of Italy’s greatest film directors. Moreover, at least two of the three lead singers of the opening run were among the best possible choices for their roles. Most impressive was Marina Rebeka, the much sought-after Latvian soprano. Her timbre is beautiful, her breath control admirable, she displays an intoxicating ease with the high notes, and her Italian diction is impeccable, as clearly confirmed by the third act’s letter scene, “Teneste la promessa.” I’ve heard more than a few native Italians butcher this crucial scene by resorting to verismo mannerisms. Rebeka’s artistry was understated, giving Violetta dignity. The final “E tardi” of the letter scene was poignant but not excessive, as is frequently the case. Her Act 1 “A forse è lui... Sempre libera” was impeccable, with subtle differentiation in the various moods of the long scene: pensive, hopeful and nervously aware of her insurmountable condition. Often the “Sempre libera” part is rendered as if Violetta lustfully favours her frivolous lifestyle. This was not the opera’s intention, and Rebeka rightfully makes it clear that her freedom is also her unavoidable curse, given her profession. Francesco Meli, who performed in the same La Scala production opposite Russian soprano Anna Netrebko two years ago, is an ideal Alfredo. Dashing, yet slightly gauche on stage, he is perfect as a provincial young man transported to the capital. Vocally secure, he is stylistically a convincingly eager, simple and impetuous Alfredo. Leo Nucci, now well into his seventies and possessing reduced means as compared to his earlier self, nonetheless utilizes deftly his limited vocal abilities, ably portraying the elderly father. This is not a heroic Verdi baritone role like Boccanegra, Macbeth or Don Carlo’s Don Rodrigo. While diminished in voice, his obvious understanding of the role and his craft were profound. It was truly a marvel to witness such artistry. For once, Giorgio Germont is a confounded man. His initial mood is nervously aggressive as he expects to confront a harpy. However, he encounters a lady, despite her prior profession. Such a vacillation, almost certainly Cavani’s brilliant vision, is masterfully expressed by the seventy-six year old Nucci. Myung-Whun Chung led La Scala’s orchestra with sometimes slow tempi, especially in the Act 2 Violetta-Giorgio Germont duet, possibly to accommodate Nucci. The advantages of having a cultured stage director with, knowledge of literature and history are obvious. Sadly, many contemporary stage directors are ignorant, and therefore produce evenings of mediocre, even laughable stagings. Liliana Cavani, in addition to being a creative director, is a woman whose knowledge of the period and its social mores contributes much to the credibility of the characters and story. The mid-nineteenth century, the setting for Dumas’ La Dame aux camélias, coincides with the Risorgimento, the years leading to Italy’s unification, a period well- known to an erudite Italian. Indeed, the lavish sets and costumes as well as the ambiance in the Act 2 soirée at Flora’s looked like an appropriate homage to Visconti’s unforgettable film Senso. It was a feast for the eyes as well as the ears.